This quilt is a wonderful example of how a pile of scraps, when combined with a couple of light and dark fabrics used as a constant, can become a spectacular quilt. 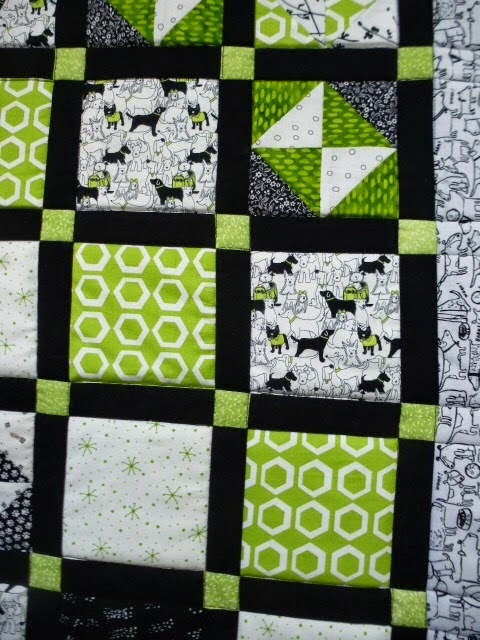 I think these are my favourite type of scrappy quilts, controlled scrappy. Using the same setting fabrics pulls all of the gorgeous scrappiness into a harmonious whole. I also think that hourglass blocks are one of my favourite ways to set scrappy blocks together. The stars surrounded by the light fabric look like they are floating in the background, and the ones surrounded by the dark fabric are so nicely framed. This was quilted with the Star in Star pantograph. I enjoyed doing this one so much, that I had a hard time letting it go to its home. I just might have to add a quilt like this to my want-to-do list. After Christmas, Rosemary brought me two quilts to do up for her. Rather than doing two separate posts for each, I'll put them both in here. 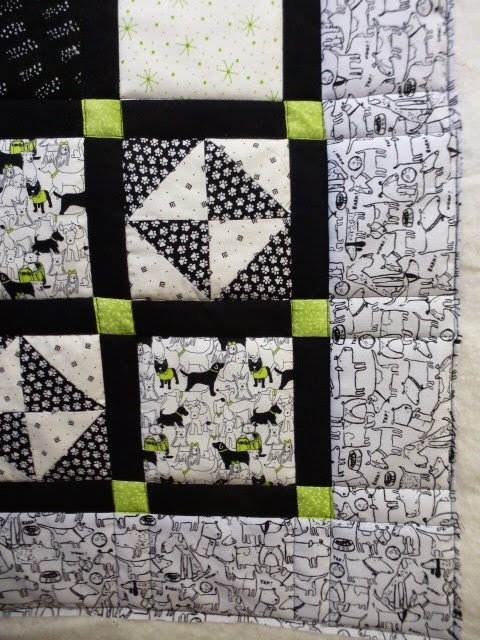 The first one is this wonderful cats quilt, with all kinds of fun cartoon cats in it. One of the fabrics has balls of yarn bouncing around on it, and that was my jump off point for the quilting design. I did swirls and loops, in the hope of mimicking the movement of bouncing balls of yarn that the cats would love to chase. When I came to the cats themselves, I went around each one with a tighter loop, so that the cats would stand out. The other quilt Rosemary brought was an angel themed Christmas lap quilt. I quilted it using the Star in a Star pantograph. Once again, the lighting isn't very good for showing the quilting. I tried playing with the contrast in the photo in order to get it to show up more, with dubious success. 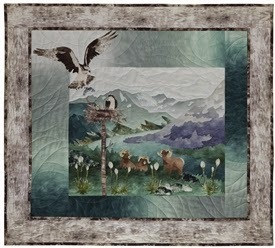 You can click on the link for the pantograph, if you want to see what the quilting actually looked like. La Passacaglia continues to hold my very firm attention. I have a second rosette now sewn into the bigger one, and am working on another one to add in. This is the small one I'm working on right now. It will actually be a partial rosette, with only seven stars added to it, since it fits in beside the one that was added in earlier this week. I think I'm going to work on this systematically and work my way around the larger rosette and do the smaller ones that fit in around it. I think I'll get a better feel for what colours will work beside each other. I'm going to continue working on this for the rest of today, and just might get this one done, and ready to set in. I've had some stash added in numbers this week, all of them for this project. Nineteen various shades of Kona solids for the star points. I'm glad I decided to go with the various bright solids for those. I'm liking the life and sparkle the colours are giving. So, I'm still in the positive numbers for stash added, but just barely. If I get any sewing done this coming week, which I will be because I have to prepare the next row for the guild mystery row quilt, I'll be back into the net stash used numbers. I'm linking up to and Kathy's Slow Sunday Stitching, Judy's Stash Report and Angie's WIPs be gone. I think I'll browse a bit and see what's happening at those places, and then it will be back to more red stars. Mibsie is in the process of making what she calls "conversation quilts", based on different themes. This one is all football. What a perfect gift for anybody who's a football fan. And, just to carry the football theme all the way thought, the quilting design is footballs, done with bright orange thread. How much fun is that?!? Just look at all those fun fabrics. I don't think I need say any more. This a baby quit that Ann brought me. I love her fabric choices. When I look at the print fabric, I can see that it is a child's print. But what I like are her choices to go with it. They aren't baby-ish at all. This quilt can grow up with whatever child it is given to. Ann requested a simple, fairly dense meander for this quilt, so that it could stand up to multiple washes. So I did the meander, with a few swirls thrown in, here and there, just to bump up the interest level a bit. There's still nothing new up on my wall. Texas Chain is still there, and slowly growing. I'm not spending a lot of time up in the studio, these days. With the weather being as cold as it is, the heat is having a hard time keeping up with keeping my studio warm. I have a really good and efficient heater up there, and most of the time it's OK. But when it's really cold and windy, like the last few days, the wind blows in under the front of the garage door, and gets under the floor of the studio, which is a room that was built into half of the garage. The air of the room is warm, but the floor is freezing. I have those foam play mats that kids use down on the floor where I stand, but even those aren't helping. My feet end up like two blocks of ice after about an hour. I really need to pull out something that I can work on down here, that doesn't need to be up on a wall. In the meantime, I do hand stitching and I knit. I have the second of my La Passacaglia rosettes finished and up on the wall. The first one is sitting in where it will eventually be sewn. Then, I went and started the third. Part of the fun with this project is actually rooting through all the fabrics, and choosing which one to use where, and doing the fussy cutting to see what kind of an effect it will produce. I have some fun Kona solid colours coming in the next day or two, which I think will add even more interest to them. I'll use them in the star points. Now that the second rosette is done, I can count that fabric as used. I'm just giving every piece in it a value of a two inch square. Some of the pieces are bigger than that, but some are also smaller. It will even out and give at least an idea of the amounts used. I'm linking up to Judy's Fabric report and Kathy's Slow Sunday Stitching and also to WIPs be Done, although this WIP of mine will not be done any time soon, at all. I'm continuing to work on my Travellers End cardigan. The whole thing is a mushed up on a circular needle that's too short to get a picture of the whole thing, so I just took a shot of the most fun part.... the cable up the back. And as I just looked at this picture, I've seen that somewhere along the line I've made a huge goof. The cables are supposed to look like the top part all the way down........ rats!!! It looks like there is some serious tinking in my future. And considering I don't know where the mistake started, I might end up having to rip out the whole thing. Looks like I reversed the cable charts somewhere. I say again.... rats!!!! On a happier, more successful note, I did manage to get a picture of my daughter wearing the finished Cinched rib Cowl. It's a great picture of her, but doesn't really show off the cowl. Don't you love the indulgent, "oh all right, go ahead and take a picture if you must" smile on her face? It's amazing sometimes, how the smiles and expressions we used as adults towards our children end up showing up on our children's faces when they become adults, and are turned back towards us. And I've started, and almost finished, another sock, using one of the new yarns I got last week. It's a Manos Del Uruguay Alegria yarn, all of which I really enjoy using. They are dyed in such a way that you never know exactly what you're going to get. The blue is spiralling down the leg, and is really quite a lot of fun, but then I am easily amused. start again, or do I put it in the never to be seen again pile, or try to selectively rip back and try to figure out where I went wrong. Here is my solution......... that sweater is now reduced to a huge ball of yarn. After examining the cable charts and what I had done, I realized that I'd reversed the charts while I was working. They were each on a separate page, and then the instructions for the cabling were on another page. So, while juggling these three pages, I got it mixed up. Every now and then I get a quilt that stumps me for deciding how to quilt it. This was one of them. It was just so perfect on its own, that I didn't want to do anything to take away from the fun piecing, and the adorable fabrics. I didn't want to spoil the quilt, and everything I thought of to do would have involved quilting on top of all those fun fabrics. Until, that is, I had an "aha" moment...... quilt it so the quilting doesn't show. It seemed strange for a quilter to be doing that, but it's what this quilt wanted. I ended up stitching in the ditch on either side of the black sashing, and extending the straight lines from the ditch stitching out into the border. It anchored the quilt together, and let the fabrics be the star of this quilt. This quilt is pure fun. There are all kinds of happy hallowe'en type fabrics in here. One of the fabrics had the words "Pumpkin Hollow" on it, which was the jump off point for the quilting design. Unfortunately, the lighting in these pictures isn't the greatest, and makes the actual quilting design difficult to see. 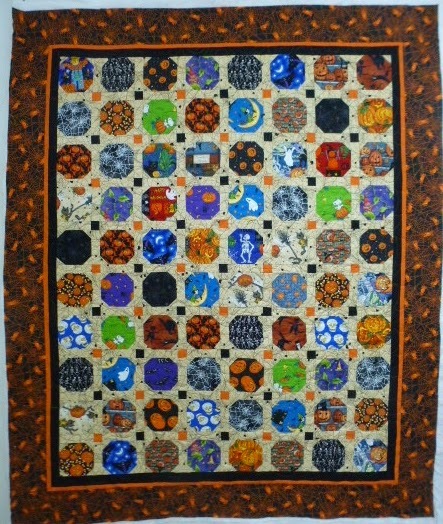 I used the pantograph My Pumpkin Patch for this quilt, along with an orange variegated thread. Way back in last September or October, Jannette asked me if I'd like to do a swap with her. I've done swaps before, and really enjoyed them, so I said sure. We decided to do a swap of Disappearing Four Patches, using large scale florals, and Kona Snow as the constant fabric. Life was really crazy at that time, so we decided we'd start the swap in January, with the goal being to have them mailed by the end of the month. We're each doing a total of eight blocks a month, two out of each fabric. We keep one of each, and send off the others. So, these were my first set that I did. And here are my first four blocks, combined with Jannette's, up on my small design wall down in the apartment. We're going to do this for ten months. At the end, we'll have 80 blocks, more than enough to make a good sized quilt each. They are so pretty!! I love them. This pattern has been on my 'bucket list" for quite a while. Such a fun, and gradual way to make a quilt! I really like the large splashes of colours from the large scale florals. It will be fun to see if we and up with any doubles. I'm linking up to Judy's Design Wall Monday and also to Monday Making. I'm hand stitching the Sunday afternoon away, working on adding the last round of pieces to this particular rosette for La Passacaglia, the medium grey stars with light and medium oranges. I had set this aside earlier this week, due to little tiny pieces overload. But I'm ready to pick it back up again. When I get the last of these stars done...... there are 11 left to do.... I can start thinking about what colours I want to go around this big one. Or, I can start working on another big one that goes on the right hand side of those dark grey stars. They all start with the same centre configuration, sort of. I'm wondering, now, whether I should stick to the light and dark greys for the stars, or branch off into other solid colours for the star points. I like the looks of the dark grey interconnecting. But I might be able to make that kind of effect in other areas of the quilt, with different colours. Decisions, decisions..... if I decide on the other solid colours, that means I need some stash enhancement, which is always fun. I'm linking up to Judy's Fabric Report and Kathy's Slow Sunday Stitching. And then, I'll continue working on this lovely rosette. I'm working on my Rainbow Scrap Challenge blocks today. There's a little bit of a couple of projects here. After looking at all of the fun novelty type blocks that have shown up in this scrap challenge, I decided I wanted to do one too. The hard part was deciding. But I finally chose these Silly Cars, a free design from Fat Cat Patterns. They only take two fabrics of each colour, a light and a dark, so they are really fast to do up. I'm planning nine of these. They'll be somewhere around 13 inches when done, with maybe some fun sashing, but I really haven't thought that far ahead. I have enough of the white for the window, and the black for the bumpers and tires to keep them the same in each car. I also have enough of the small dotted fabric to do all the background blocks the same. And best of all, it's all stash and scraps. I have yet to actually sew the fused bits down. I'm seriously thinking of digging into my variegated threads, and using a decorative stitch to sew them down. There are all kinds of stitches on my machine that I've never used. This might be a fun way to try them out. The other thing I continue to work on is the small nine patches that are three inches finished. I have enough of the strips sewn together to give me 11 of the pink nine patches. There's another strip of pink waiting to be sewn to a white strip. These get cut into 1 1/2 inch sections, and then function as my leaders/enders. So, I think I'll link these up, and then get out my instruction manual for my machine, and investigate some stitches. I haven't done a knitting post in a while, since nothing knitting had been going on. All my time and attention got hijacked by this. But my brain was beginning to turn to mush, so I've spent the last few evenings doing easy, mindless knitting on a pair of socks. All that's left is grafting the toe, and sewing in the end. I bought two balls of this wool, so that I could make sure the stripes matched on each sock. I do have a sweater on the go, as well, called Travellers End But it's at a stage where I have to really pay attention to what I'm doing, which doesn't fit the definition of "mindless". I think I'm a row or two away from splitting off the sleeves. And then, I received a delivery of some fun yarns yesterday, all of which have specific projects planned for them. Wanna see??? First off, came some Cascade 220 to go along with stuff I already had. I have four hanks of the light grey, one of the pink and a couple of the purple. So, I ordered the blue, orange and green to go with the others. these are for a Hay Cove sweater. Then there's this lovely Manos del Uruguay Allegria sock yarn, which is going to get wound and is going to be my next start for socks. It will be interesting to see what emerges from the way the yarn is dyed. I have made two other pairs of socks using this brand of wool, and they are just so soft and warm. And then I ordered four hanks of the lighter coloured Malabrigo Rios to go with the leftovers that I had from making my On the Grass sweater. I think these are going to go into a Tea with Jam and Bread. It seems like every time Judy posts a picture of a sweater pattern that she's either working on, or is on her to-to list, I also like the pattern, and put it onto my to-to list. 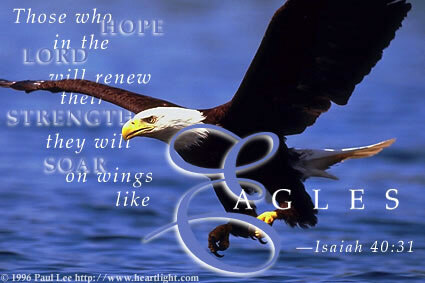 I love how all of us can inspire and encourage each other on our blogs and through the linky parties. So, with that in mind, I'm linking up to Judy's On the Needles. And then, it just might be time to get this day started. This quilt came to me from Laura. She made it for her husband as a Christmas gift. It's a memory quilt, made from shirts from his Grandfather. And if my memory serves me correctly, this is also her first attempt at making a quilt. She did a fabulous job. I love receiving quilts like this to work on. It's an honour to be included in the effort to keep the memories and the love alive. With all of the plaids, and all of the straight lines in the fabrics, it made perfect sense to use the Square Dance pantograph. Now, even the fabrics that don't have checks or plaids, look like they do. I'm sure her husband was thrilled with this quilt. There were a lot of second and third parties involved in the getting of this quilt to me, and then back to Laura, in order to maintain the secrecy. It was all such a lot of fun. 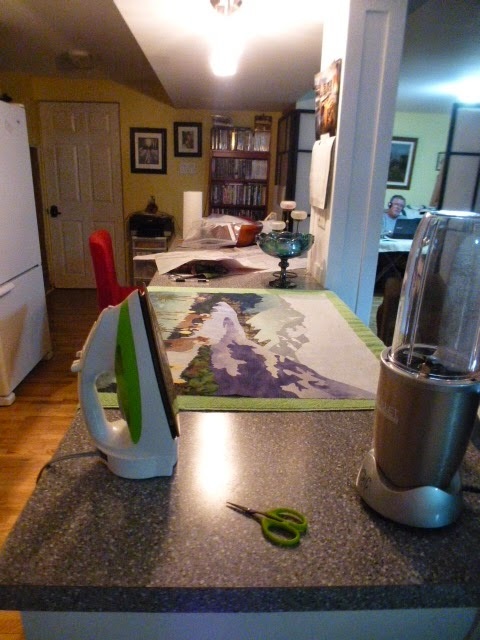 I've staged a semi-hostile take over of the kitchen counter this evening. It's the only place high enough and big enough to be able to spread everything out for tracing and ironing purposes. After quite a few months packed away in the box, I've decided to pull out True Nature, a design by McKenna Ryan. Before tonight, I'd gotten all of the mountains, the mountain sheep and all the water and large foreground pieces done. Tonight, I did up the rocks and the plants in the close foreground. Once I had all those on, I was able to go over the whole thing and give it a good hot press to set everything in place. The picture is showing a bit greener and a bit darker than it really is, but it's pretty close. There's still a tree with an osprey nest at the top of it to go on, and the large osprey to make, and save for later. This is the picture of the finished block, taken from the pattern envelope. I'm doing the whole quilt, so the osprey will go on once the whole thing is sewn together and the borders are on. There's still a long way to go, especially since all the feathers in the bird's wings are all traced, fused and cut individually. I'm linking up to the Canadian Needle and Thread Network for work in progress Wednesday and also to WIP's be gone, although this one won't be gone for a very long time. After this, I think I'll take it easy, maybe pull out some knitting and watch the next part of the series The Book Of Negroes. This is my first finish of the year. It was started way back in 2012, as a leader/ender project. The top was finished about a year ago, and then it sat and waited to be quilted. I finished the quilting a couple of weeks ago, and then it patiently sat, yet again, and waited for its binding. I finished the binding on Monday. I have decided to name this one Four Square. I had a lot of fun with the quilting. I saw a pantograph that was done with a version of these shapes, and thought that I could probably do something similar to it, but free hand, using the squares as a guide for size and direction. I had to work it out on graph paper first, and kept the drawing as a guide for which direction to go. I did the binding, as usual, with a diagonal striped fabric, and a faux piped technique. I love the look and the little bit of colour that piping gives. The fact that the piping also acts as a guide for machine sewing in the ditch to finish the binding is a wonderful bonus. I know lots of people who really enjoy the process of hand sewing their bindings, but that has always been the part of making a quilt that I've liked the least. So this is my go-to binding technique. There's a tutorial here if you are interested in trying it. I pieced the backing out of some light green fabrics that have lived in my stash for quite some time. I'm liking the look of pieced backings more and more as time goes by. It also does wonderful things for the stash report. Rather than buying new yardage for a backing, I can use what I've got. The challenge is to come up with a combination that looks like it all works together. The final size of this quilt is 72x88. It used up a ton of my scrap 2 1/2 inch squares. However the box of those is no where even close to empty, so it's time to start thinking of another project for them. I have one in mind, but it will involve some cutting of yardage for the constant fabric background, so it's going to have to continue to knock around in my head for a while yet. I'm linking this up to a couple of finish parties: Sarah's at Can I get a Whoop whoop and finish it Friday over at Crazy Mom Quilts. I'm still working on my Texas Chain quilt, which is another Judy Martin quilt. I'm not sure, off the top of my head, what book it's from, and I'm too lazy to go upstairs to the studio to find out. It's slowly coming together, little bits at a time. It has to go directly from the design wall, to the sewing machine, so I only work on it when I'm upstairs. It's rather amazing how much it shrinks up, once the seams are sewn. I would have stayed up stairs and done some more on this, but it's really cold out side, and the heater in the studio is having a hard time keeping up, and my poor toesies are getting cold, even with two pairs of socks, one of them wool hand knit, and a pair of warm slippers. I guess there's a limit to what can be expected from a room built into a garage, which is what my studio is. I finished a quilt today, binding included, but I haven't gotten a picture of it yet. that's on my to-do list for tomorrow. In the meantime tonight, I'm going to do some more hand stitching on my current obsession, after I link up to Judy's Design Wall Monday and also to Love Laugh Quilt's Monday Makings. I must confess to being totally obsessed by this project, La Passacaglia. It has completely taken over almost all of the time that I spend with hand projects. It's even eclipsed the late night knitting I usually do and the evenings spent with my sewing machine. I looked at the clock last night, and I was still working on this at 11:30. My eyes have usually given out for hand work by that time. Each time I add a round on this, I'm thinking ahead to the next one, wondering what fabric will work the best. I am having so much fun with this. The medium grey at the top is going to be the star points for the last round that goes on next. I'm not exactly sure yet, what will go in the centre of the stars or in between them. More stash digging will be involved, I'm sure. There might be a peach or light orange in there, to act as the compliment to the blues. Hmmm.... yes, I like that idea, I'll have to give it a try. As for the stash report..... there's been a little that I can count as used..... some binding and a few rows of Texas Chain sewn together. Next week should see me back into stash busted numbers. I'm linking up to Kathy's Slow Sunday Stitching and Judy's Stash report. Then, I'm going to go back to work on this hand stitching project.